What's more dangerous - texting while driving, or driving while drunk? Is there a law that prevents robots from intentionally hurting humans? And is Google silently eliminating left-hand turns from their online mapping service? Today's Geekly Update is jam-packed with the latest tech news. It's *guaranteed* to make you 146% smarter. Read, think and comment! Want to write the next billion-dollar app? Google’s new Android Basics Nanodegree is a free online course that takes even non-programmers gently through the basics of writing Android apps. A new online game vividly illustrates the danger of texting and driving, in case your stubborn textaholic refuses to belieive research that shows texting is as bad as drinking alcohol before driving. Product Hunt is a new service avaialble via IFTTT, “your personal robot,” as I called it in my review. Product Hunt helps geeks stay abreast of what’s new and geeky. It could also find lawn mowers for you, I suppose. A Google Blog post explaining how Google Search’s auto-complete feature works is quite revealing. The post arose from complaints that auto-complete sometimes completes a search query with words that are “offensive or disparaging,” especially if the person being sought is running for public office. A Texas man saved his home from rising flood waters using instructions he found on the Web for building a temporary dam really fast. "No one’s actually made a robot that was built to intentionally hurt and injure someone," said Alexander Reben, a roboticist and artist, went ahead and built a robot that randomly stabs people’s fingers, drawing a bit of blood and inflicting maximum pain. 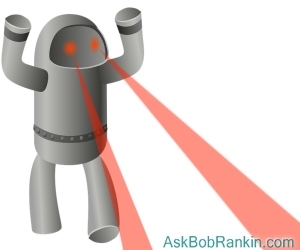 Reben thinks the actual existence of a robot that violates Asimov’s First Law of Robotics will get people to do something to prevent the imminent robot revolution and slaughter of humanity. Amazon faces a $350,000 fine for shipping prohibited, dangerous items through common carriers such as the USPS and UPS. This is the 25th time Amazon has been fined for endangering the lives of distribution workers. The latest incident gave nine UPS employees skin burns when a one-gallon container of “Liquid Fire” corrosive drain cleaner leaked in transit. And Amazon thinks it’s going to drop packages from drones onto my lawn? An online Bible study site dares to call itself, “the Google of The Bible” - allegedly with Google’s approval. Five years in the making, Hatanakh.com “includes the first comprehensive digital edition of the Bible, commentary, articles, religious lessons, and Google Maps that let users ‘tour’ biblical locations.” You'd better brush up on your Hebrew before visiting this site, and don't expect to find any of the books of the New Testament here. If someone you know disappears, you may want to check hospitals and jails. JailRoster.org has over 2,000 county, state, and federal jails in its database, and many include pages where you can search for inmates. Often, a jail will give you more information about a “guest” than a hospital will. Two New York emergency medical technicians have resigned their jobs after being caught choosing to delay responding to an emergency call while they awaited their dinner in a White Castle drive-thru lane. They were caught because they live-streamed their poor decision via Periscope, the app that lets you rat yourself out to dozens if not millions of people at once using just a smartphone. Facebook has made its suicide prevention tools available to all members. If a friend’s post makes you suspect he may do himself harm, just open a new drop-down menu and choose from several options. You can do everything anonymously, from sending your friend a list of suicide hotline numbers to summoning “those nice young men in their clean white coats.” Surely, none of the fun-loving but ultimately responsible folks who call SWAT teams to innocent people’s homes will abuse this new set of tools! Wal-mart wants to give you shopping carts that follow you around the store and to your car, and helps you find items on your shopping list. Tests are underway in selected stores. Waze, the commute optimizing app from Google, is now doing its best to eliminate left turns from driving directions. UPS has long done so for its drivers, and finds the practice saves time and gasoline. Google is tweakings it search algorithm so that the first results of a search for medical symptoms will yield information from reputable, trusted sources instead of folk medicine and quackery. Just as Japanese restaurants are firing robotic servers, stock brokerages are moving back to human stock pickers because artificial intelligences just can’t do as well as human brains. Rifles and other gun-related images were excluded from the new batch of Unicode emjois at the insistence of Apple, Microsoft, and other tech firms. But there’s now a bacon emoji, so cheer up. A clothes dryer that dries laundry with ultrasonic waves will save energy and get the job done in a fraction of the time that heat-tumbling dryers require. Cables and satellite TV companies lost 385,000 subscribers in 2015, up from 125,000 in 2014. But incumbents need to worry more about Millennials; 80% of them subscribe to at least one streaming service, and many have never subscribed to a cable or satellite service. KFC is now offering fried chicken in boxes equipped with battery packs and USB ports, so diners can charge their devices while trying to avoid getting grease all over them. Bitcoin is a threat to money market stability and central banks’ control, according to U.S. financial regulators, and should be closely monitored and saddled with new regulations. “First they ignore you, then they laugh at you, then they fight you, and then you win.” -- Gandhi. That useless old Sega Saturn game console gathering cobwebs in your garage could be worth twice what your paid for it. TotallyMoney.com will tell you what your obsolete tech devices may be worth. A Malware Funnel Pre-Installed on Your PC? Most recent comments on "Geekly Update - 05 July 2016"
Didn't a later Asimov book postulate the zeroth law that put humanity above a human life? So a robot could kill a human(s) if not doing so would harm humanity as a whole. Thanks so much for all the info. I especially liked the robot idea. It focuses everybody's attention on the potential power of these robots. "The latest incident gave nine USP employees..."
KFC boxes w/ batteries: VERY BAD idea, we already put too many batteries into our landfills; surely these will end up there as well. No thanks. This technology could be helpful for handicapped shoppers, but I get my exercise pushing my own shopping cart. No LH turns? No good for those of us in RHD countries. Hope allowance made for this. Yet another interesting artical. I will save this for when I become a Geek. No. Actually here's a Youtube link to the song with printed lyrics. Thanks for the link. Brought memories of long ago.